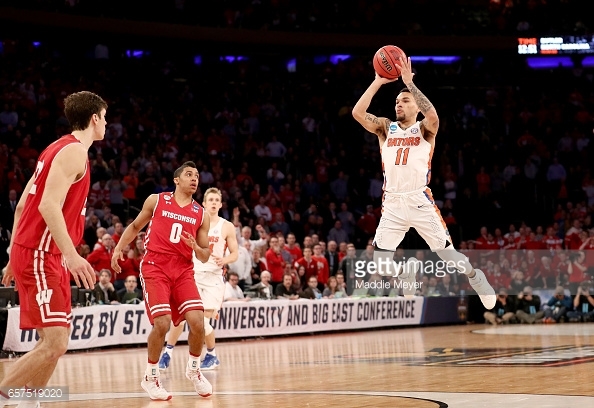 NEW YORK- The fourth-seeded Florida Gators are headed to the Elite Eight of the NCAA Tournament after a last-second floating three-pointer found the bottom of the net for junior guard Chris Chiozza. But to understand how the game ended, it’s important to know how it got to that point. Florida began the game with little offensive flow. The Gators were down 16-6 with twelve minutes left in the first half. However, Florida would scratch and claw their way to a two point halftime lead. The Gators went on a run in the second half and earned a 12-point lead with 4:30 to play. However Florida went into ultra conservative mode, and Wisconsin jumped on the opportunity. Wisconsin had possession with six seconds left in regulation trailing by three, and Zak Showalter hit a floating three-pointer to send the game into overtime tied at 72. Showalter sank the shot and moved into Badger lore. However, the story doesn’t end there. There was an extra session to be played. And in keeping with Badger lore, Wisconsin raced to a 80-75 lead. Florida looked out of sorts in overtime, missing their first five shots before senior Canyon Barry made a layup with 1:34 to go. Florida went into foul mode, forcing one of the nation’s worst free-throw shooting teams to win it at the line. Barry would make two free throws to make it a two-point game with 37 seconds remaining, but Wisconsin broke the full court pressure. While Khalil Iverson drove uncontested to the basket, Barry refused to give up on the play. Barry tracked down Iverson and blocked the shot on the way up. The hustle that Barry exhibited is exactly why this Gators team has been successful. The Gators have played for each other, and hustled, and overcome. Chiozza would make a layup to tie the game at 81 with 24 seconds. Wisconsin’s Nigel Hayes was fouled by Justin Leon with just under 4 seconds left, and sank both free throws calmly. That led to the dramatic four seconds that turned Chris Chiozza into a household name. KeVaughn Allen led the Gators with a school NCAA tournament record 35 points. Allen made 11-24 shots and 4 of his 12 three-point attempts. For long stretches, Allen seemed to be the only Gator capable of scoring. Florida advances to the Elite Eight where they will meet SEC rival South Carolina. South Carolina easily defeated Baylor 70-50 on Friday. The Gators and Gamecocks met twice during SEC play, both teams winning home games.